So on the OP, I'll always have Tier I schedule / results and what not. 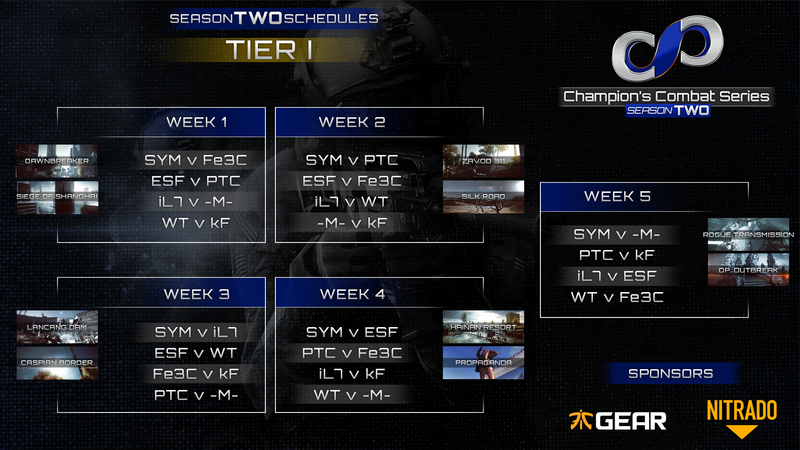 Going to make an update for Week 5 for Tier I, as I believe popular opinion is to do "inter" region play for the last week. This is opposed to playing the same team twice in the regular season. We had some outstanding games this past week and ALL matches were played on time with little to no hiccups (for what I understand) SO GREAT JOB ALL TEAM LEADERS! THANK YOU! Match comms are live as well as the docs, let me know if you need access to yours. So, everything should be up to date now. But, lets recall what went down in some games that were streamed last week in our "Caster's Recap"
WHERE TO EVEN BEGIN?!? These teams were absolutely spectacular today and had a great showing on the first map with the second map being quite a bit slower. On Zavod we had STEEL coming out strong on both openings but ESF responded kindly by setting the flow action for STEEL. STEEL was forced for first half of this map to just respond to ESFÂs movements and rotations. Finally STEEL was able to break that trend and found their footing nearing the half way mark and was able to win the first half. Going into the second half it was a straight repeat scenario, STEEL wins the opening, ESF sets the pace but ESF was able to win the late game but not by enough tickets and STEEL ends up winning the first map by a ridiculously close amount. Going into the second map STEEL started strong yet again and had map control at the start but then quickly lost that control to ESFÂs dominating vehicle presence. Second half of the map went the same way and ESF won the map in total. PTC really can go the distance on maps that I simply wouldnÂt expect them to do so well on. The teams started out on Silk road and right away Sym took control of the map, each team putting pressure on the outer gimme flags. DELTA flag was the big point of action on the first half but Sym was able to hold their 3 flag burn and won by a significant amount. Going into the second half though PTC stepped up and took the center flag and won DELTA right away. PTC took control of the map from the start and then started putting pressure on SymÂs second flag and eventually took four flag control of the map. Overall PTC had a great comeback and won the map by 6 tickets. Going into Zavod though PTC had an unusual strategy and tried to use UCAVs to win the opening chopper fight. PTC tried to play the outer flags and never quite had their infantry in position to respond quickly to a rotation. It didnÂt work both rounds and both rounds Sym controlled the center flags and won by at least 200 tickets each time. Thanks @Scotch for casting our matches! And thanks Team and Team leaders who participated this week. We had a great week and competitive week. Hopefully this next week is even better! A bit of a quick match this time as kF had some connection issues. kF won every opening that they played and on Lancang they had control of the map for a good amount of time. It led to kF winning the first round but on the second round kF lost a player and unfortunately he was in the LAV at the time. This led Steel to taking control of the map and winning. In the second map, Caspian, kF once again had the superior opening but quickly lost control of the map and Steel won the map with kF forfeiting the second round due to a loss of players. Lots of strong vehicle plays from both teams for both maps. On Lancang Symthic had some of the best rotations on the first round and even on the second their rotations were quite on point. They were able to hold onto the BRAVO flag the entire first round due to their boat but the second round saw them lose control of BRAVO and forced to play in response to Ilu7ions rotations, costing them the first map. Going into the second map there was a lack of rotations by both teams and they played on the center flags a majority of the time. The vehicle's decided which team would control the map and that was Ilu7ion the first round and Symthic the second round. 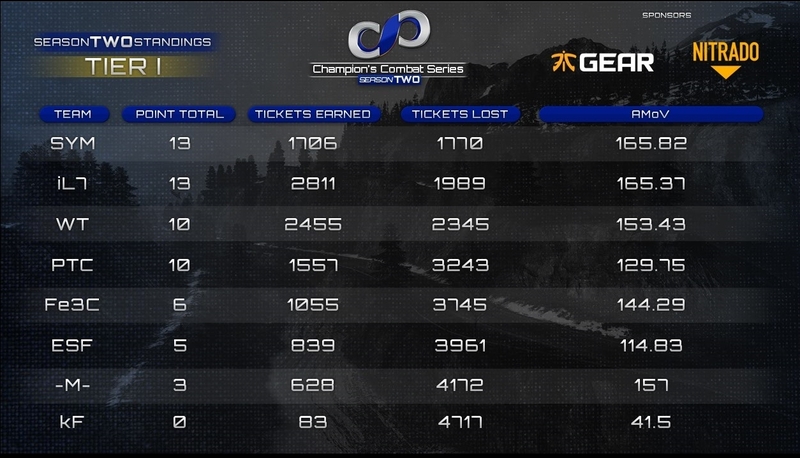 In the end Symthic lost the total ticket difference by 5 tickets but won the second map. The name of this match? Tier 1 no sleepers. PTC won the openings on Lancang and Caspian and had better rotations even with the lack of sleepers. -M- had great comeback on the first round of Lancang when they pushed hard with their boat and Scout Heli and that allowed them to secure the win. PTC though had took full flag control on the second round and that led to them winning the map by a narrow margin. Going into Caspian though we really see the advantage of the US side shining through as PTC won by quite a bit. Disillusioned, -M- came into the last round really slow, yet won the opening. They ended up just losing vehicle battles and infantry battles causing them to lose control of the map and they werenÂt able to make use of that US side advantage. Best of luck everyone! Match Comms are up! Infantry focused teams facing off led to some honestly low kill count games surprisingly enough. The first map we had PTC dominating in the vehicles both rounds and I think this caused them to lose this map. PTC is normally heavily focused on their infantry game but because they kept winning with their vehicles, they actually had less infantry to work with causing them to lose the infantry centered BRAVO flag on hainan. Going into the second map on Propaganda we had PTC come out strong on the first round with excellent rotations and sleepers. The second round both teams stepped up their game with excellent rotations but PTC just was on the back foot too often and caused them to lose the ticket point but win the map. Symthic showing how it is done in 10v10 comp, locking ESF out although ESF had a very strong comeback the first round. On Hainan Sym locked ESF out but lost control the first round and ESF had a great comeback but it was just too little too late. Second round and second map, Sym easily took control of the maps and locked ESF out from the flags. Significant ticket wins for Symthic. Additionally guys, we're FINALLY to the last week. Week 5 means we're going to roster lock. Meaning TOMORROW (Thursday, 4/14) we're going to lock the rosters. Get any additional players moved to your rosters as teams will be more strict with ringers during the playoffs (which should be expected). Match comms are LIVE, and I'll bump the thread tomorrow when the standings get updated! Best of luck in Week 5!